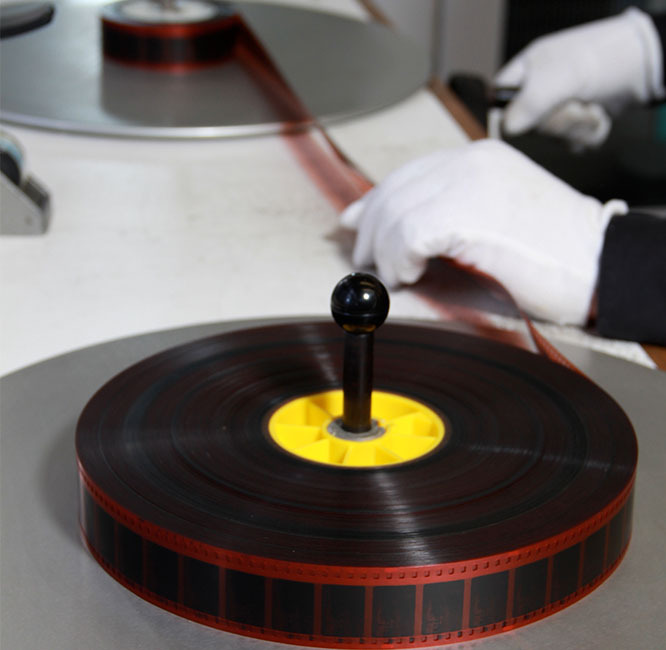 In addition to digitising still image archives, we also offer an expert digitisation service for scanning audio visual material; including cine film and other legacy video formats. Why digitise your audio visual archives? Digitising audio visual material is not easy and requires specialist equipment, which is why few archives undertake AV digitisation in-house. Problems with degradation of many analogue AV archives (as a result of conditions such as vinegar syndrome, mould and sticky shed syndrome) and technical obsolescence of formats are two key threats to audio visual cultural heritage material. Converting analogue film and tape collections to digital formats can preserve their precious content and enable opening up of access to the material online through digital collections management systems such as PastView. Digitisation can also allow for the video footage to be restored and enhanced using grading and digital restoration techniques (see below). Using state of the art Scanity HDR scanner, we are able to digitise 35mm and 16mm and capture from 0.25K up to 4K resolution. Using our MWA Choice Scanner we are able to digitise 9.5mm and 8mm formats and capture up to 2K resolutions. If you have a collection of film reels and are unsure of precisely what they contain, we also offer a low resolution scanning service which can be a very cost-effective solution to get a rough digital copy of the footage and gain an understanding of what the reels hold. Image below: 35mm film being checked and prepared for cleaning, prior to being scanned. Once we have confirmed that the film is transferrable, in order to ensure the clearest, highest quality scans possible we will then clean the film using our gentle cleaning system before digitising it. Colour grading is the process of altering and enhancing the colour of a motion picture, video image, or still image either electronically or digitally. Once we have scanned your film to produce DPX master files, our expert technicians will then adjust the chrominance and luminance of the files to produce a final grade. As part of our film digitisation service, we also offer several additional optional services to restore and enhance the digital versions of your film. Each of these processes is run separately on your digitised film, so to apply all four services requires four “passes” over the digital files. 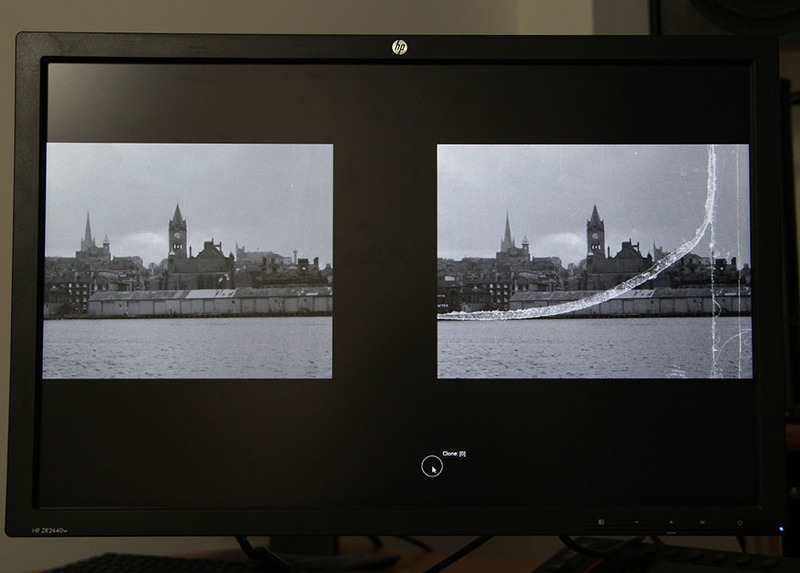 Image below: Right image shows a screenshot of footage before grading and restoration processes had been applied, left image shows restored image after these processes. For cinefilm and 35mm film we will ordinarily provide the scanned footage to you in several digital formats. Beyond cinefilm and professional motion picture film, we are also able to digitise a multitude of legacy video and tape formats. Please note: whilst we digitise these at the highest resolution that the format allows, this normally tends to be SD/HD. We do not generally apply grading processes to tape and legacy collections because they are ordinarily of insufficient quality to do so. However, some tape material can be restored but needs to be looked at on a case by case basis. If there are any video formats that you are looking to digitise, even if they are not mentioned above, please contact us.